Members of the growing data journalism community in Brazil gathered from Nov. 10 to 11 for the third edition of the Brazilian Conference on Data Journalism and Digital Methods, Coda.Br, in São Paulo. The event featured more than 40 hours of training workshops – there were opportunities for experienced users in programming and data visualization to deepen their knowledge and also to introduce beginners to simple spreadsheet techniques and database cleaning. Coda.Br was organized by Escola de Dados, a program of Open Knowledge Brasil, in partnership with the Google News Initiative. The conference is supported by the Knight Center for Journalism in the Americas, the Brazilian Association of Investigative Journalism (Abraji), the Volt Data agency, the Serrapilheira Institute, the Python Foundation and Nic.Br. Several of these workshops were taught by Knight Center course instructors, such as University of Miami professor Alberto Cairo, Jota data editor Guilherme Jardim Duarte, and data curator at Google News Lab, Keila Guimarães. This range of options has allowed Coda.Br's audience to expand to more than 360 people this year, according to Natália Mazotte, director of Open Knowledge Brasil. "We increasingly have been able to speak with a different audience. Journalists have felt the need to incorporate multidisciplinary knowledge. There is a move to make data journalism mainstream, and so Coda has become more comprehensive,” Mazotte said. Journalist Michel Silva, who works as a communicator in the Rocinha favela in Rio de Janeiro, participated in Coda.Br for the first time. He was one of 30 scholarship recipients selected in a Escola de Dados initiative to democratize access to this year's event. "I've gotten to know some tools that I will incorporate into my work repertoire, and I hope I can produce more reporting on favelas using that knowledge," he said. "In the favelas of Rio there is a very great deficiency in the production of data. I think it's important to have more people from the periphery in spaces like Coda." One of the tools he intends to use is QGIS, to create maps. "It caught my attention because I had already made a cultural map of Rocinha using a Google Maps list, but QGIS has a lot more functionality," he said. Also participating in the congress were professionals who do not work in newsrooms, such as Gabriel Hoewell, a researcher linked to the Federal University of Rio Grande do Sul. "In the workshops I thought of bringing new tools into the classroom, especially those for free and open source investigative journalism," he said. One of the main goals of Coda.Br this year was to stimulate the strengthening of the community of professionals working with data in Brazil. Novelties of this edition were mentoring sessions, in which journalists organized themselves freely to exchange experiences on the Law of Access to Information and to ask questions about programming languages. On Twitter, users shared links from the workshop presentations with the hashtag #CodaBR18. "We are always trying to bring new ideas to a more open and collaborative conference. We want people to come back to Coda next year getting to know each other better," Mazotte said. Although most of the conference's programming was focused on practical workshops, discussion panels offered spaces to rethink the main issues that Brazilian data journalists faced in a year of general elections. 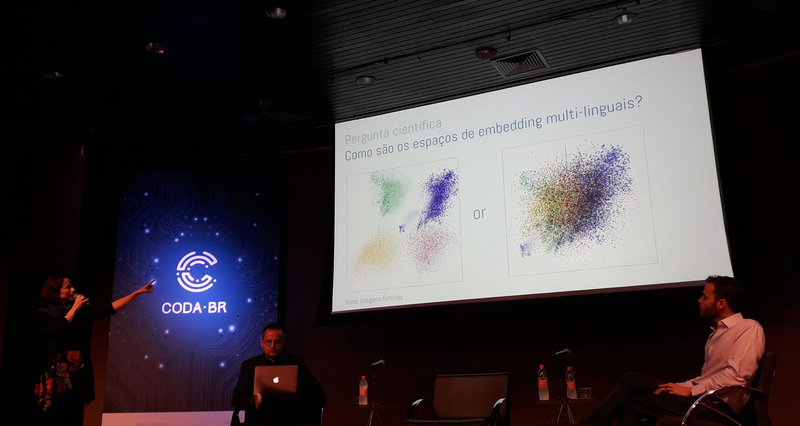 Alberto Cairo and Fernanda Viegas, a senior researcher in artificial intelligence at Google Brain, debated about how to democratize access to data visualization. While Cairo underlined the importance of expanding the use of free Dataviz tools in small newsrooms, Viegas highlighted the need to make graphics that are comprehensible to the general public. "We have to take the user's hand and explain each element of the graphic material produced," she said. At the talk "And when the data is not available?" Sarah Cohen, former editor of The New York Times data team, ProPublica developer Jeremy Merrill, and Steffen Kühne, developer of German radio station Bayerischer Rundfunk, shared their experiences with projects in which their newsrooms had to produce their own data with crowdsourcing initiatives. Kühne showed how his team used automation to send more than 20,000 e-mails to German real estate agencies under names of different ethnic backgrounds. The result was the report "Hannah and Ismail," in which they found that names of Arab or Turkish origins were discriminated against and received fewer answers with information about apartments. 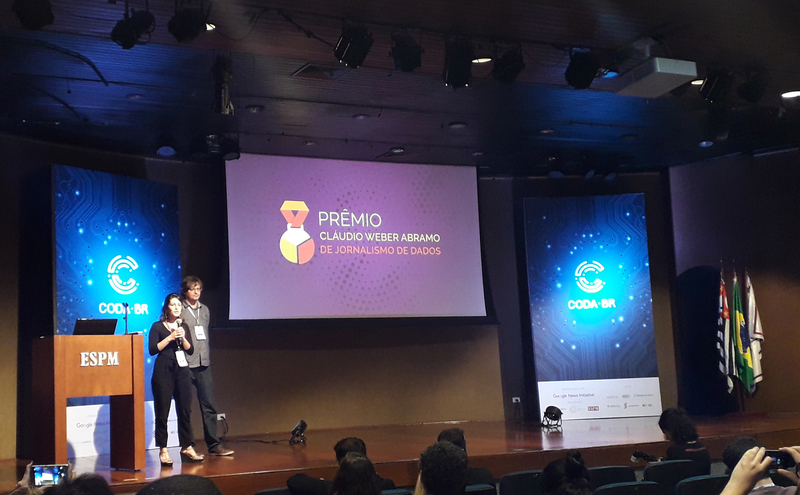 The conference also served as a platform to launch the Cláudio Weber Abramo Award for Data Journalism, the first of its kind in the country, organized by Abraji and Open Knowledge Brasil. The awards will celebrate works published between Oct. 1, 2018 and Oct. 1, 2019 in the following categories: investigation guided by data, visualization, open data and innovation. Entries can be submitted starting June 26, 2019. The following judges will evaluate the entries: Alberto Cairo, professor at the University of Miami; Carol Rozendo, designer at MIT Media Lab; Fabiano Angélico, consultant for Transparency International; Flor Coelho, editor of La Nación Data; José Roberto de Toledo, editor of the piauí magazine; Juan Torres, manager of Escola de Dados; Marco Túlio Pires, news lab lead at Google in Brazil; Mariana Santos, CEO of Chicas Poderosas; and Tiago Mali, coordinator of courses at Abraji. The name of the award is a tribute to journalist and transparency advocate Cláudio Weber Abramo, who died in August of this year. "He was the pioneer in data journalism in Brazil," said Abraji President Daniel Bramatti. "What most gains my admiration is what motivated him: the combination of the search for data with a public spirit. He always had the public interest in mind and we shared it with him. " Mazotte believes that the community of data journalists will increasingly play a leading role in the fight for transparency and openness of data. "This group has a power of pressure and influence that helps prevent setbacks. Data journalists will play a key role in a context in which evidence is questioned and opinion is more relevant." *Note: Natália Mazotte is also a contributor to the Knight Center for Journalism in the Americas.